Firefox Accounts (FxA) is an identity provider that provides authentication and user profile data for Mozilla cloud services. We are also exploring the possibility of allowing non-Mozilla services to delegate authentication to Firefox Accounts. Creating a Firefox Account requires a user to give us a pre-existing email address and choose a password. The user must verify their email address via an email link sent to the email address she provided. The user will not be able to login to attached services prior to verifying her email address. To login to an existing Firefox Account, the user must provide the email address and password given during account creation. If the user forgets her password, she can reset via an email link sent to the email address given during account creation. All new relying services should integrate with Firefox Accounts via the OAuth 2.0 API. There is also a legacy API based on the BrowserID protocol, which is available only in some Firefox user agents and is not recommended for new applications. The OAuth 2.0 API is the preferred method of integrating with Firefox Accounts. It is built on open standards, is available across all platforms, and gives relying services access to user profile data. To delegate authentication to Firefox Accounts in this manner, you will first need to register for OAuth relier credentials, then add support for a HTTP redirection-based login flow to your service. Firefox Accounts integration is currently recommended only for Mozilla-hosted services. We are exploring the possibility of allowing non-Mozilla services to delegated authentication to Firefox Accounts, and would welcome discussion of potential use-cases on the mailing list. name - a user friendly name for your service, e.g., "Firefox Marketplace". redirect_uri - a HTTPS endpoint on your service, to which we can return the user after authentication has completed. client_id - an 8 byte hex encoded client identifier for your service. This value is not secret. client_secret - a 32 byte hex encoded secret for your service to authenticate itself to the back end FxA OAuth service. This value is secret. Despite its name, this value should never be stored on or given to untrusted client code on users' machines. It should only be used from the service's backend machines to access authenticated API endpoints on the Firefox Accounts OAuth server (e.g., https://github.com/mozilla/fxa-oauth-server/blob/master/docs/api.md#post-v1token). For development purposes you can use the Firefox Accounts OAuth Credential Management dashboard to provision relier credentials. Our development environments support "127.0.0.1" and "localhost" as valid "redirectUri" values to ease local development. Note that the client_secret is your responsibility to keep safe. If you lose it, we have no way to recover it, and it will be necessary to issue you a new secret. We also recommend that you subscribe to the Firefox Accounts notices mailing list, a low-traffic list that is used to publish important feature updates and security information. scope - the requested scope of FxA user data or API access. Currently, only profile and related sub-scopes (e.g., profile:email) are supported. state - an alphanumeric value created by the relying service and associated with client's session. It's up to the relying service how this can be used, but it's primary and recommended purpose is to prevent forgery attacks. Navigate the user's client to the FxA OAuth authorization endpoint. This URL should come from the "authorization_endpoint" key in the discovery document, and the request must include URL query parameters for the service's **client_id **and a state value. Refer to the FxA OAuth documentation for further information about this step and optional parameters. code - an alphanumeric string that the relying service can exchange for an Firefox Accounts OAuth 2.0 access token for the user. A code typically has a lifetime of 15 minutes. Verify the client_id in the redirect request matches its own client_id. Verify the state in the redirect request matches the state value previously associated with the client session. A failure in either of these verifications indicates a security error and the relying service should re-start the login flow. If the relying service receives one of these requests when the client session is already associated with a FxA user, it should be ignored. If the above security checks pass, the relying service can proceed to exchange the code provided in the redirect from Firefox Accounts for an OAuth token for the user. This must be done from the relying service's backend server and not from untrusted client code. The service can exchange the code using the "token_endpoint" URL from the discovery document. Refer to the linked documentation for further details. Some fields may be missing if the appropriate scopes were not requested, or the user declined to share the information. be used as a sessioning mechanism to track logged in users. Relying services should have their own sessioning mechanism independent of FxA OAuth tokens. For chrome code in Firefox Desktop, we provide FxAccountsOAuthClient.jsm for easy integration with FxA OAuth. Relying services must first become an FxA OAuth relier. Firefox Accounts offers an end-to-end encryption feature for OAuth reliers by deriving a strong encryption key from user's password. You can find more information about this feature on its own documentation page. Integrating services should use the OAuth2.0 API. 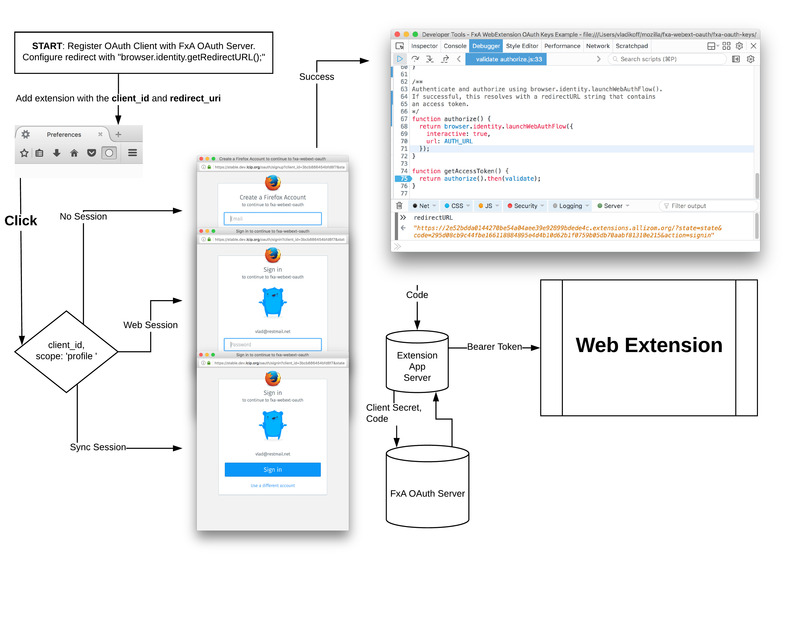 The BrowserID API is reserved for existing legacy applications. The Firefox Accounts BrowserID is available to chrome code in Firefox Desktop and Firefox of Android. The BrowserID based FxA API is currently used by Firefox Sync. Going forward, we recommend chrome based services in Firefox Desktop integrate with FxA OAuth using the FxAccountsOAuthClient. After a relying service has obtained an FxA OAuth access token for a FxA user, it can access Mozilla service APIs that use FxA OAuth. This is largely a work in progress, and we expect the number of APIs that use FxA OAuth will grow and evolve over time. The Firefox Accounts profile server stores and provides user "profile data". Please refer to the FxA profile server documentation for further information. We provide FxAccountsProfileClient.jsm for easier Firefox Desktop integration. We created a test relier that delegates authentication to Firefox Accounts called 123done, a simple TODO application. 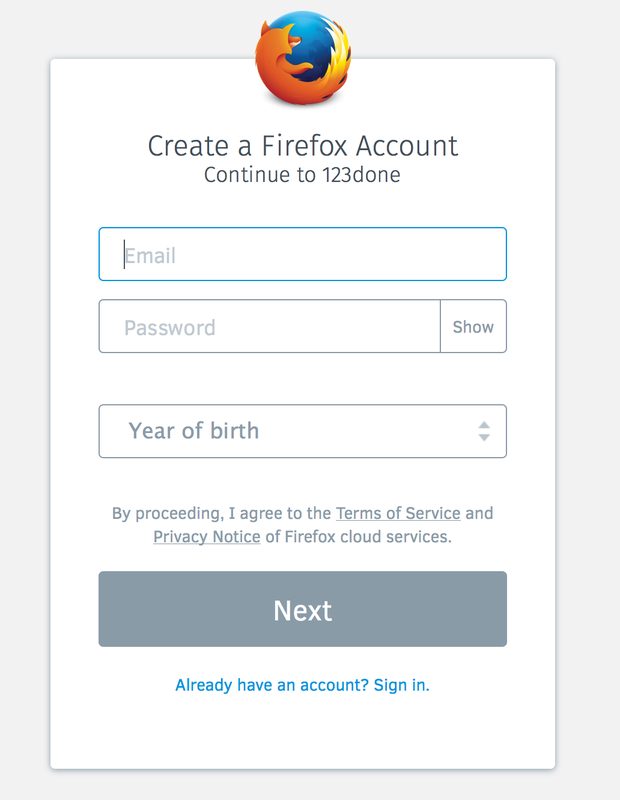 You can use this Web application to create a Firefox Accounts and use it to log in to 123done. Refer to the 123done source code for further details. URLs for various production, stage, and development deployments. To use these, you can follow the directions in the Run your own FXA server HOWTO, or you might consider using vladikoff's fxa-dev-launcher. Below is a list of current and future Mozilla services that delegate authentication to Firefox Accounts.